Originally from Germany, Martin is a Sydney-based choreographer and dancer. He is best known for his full-length solos, fusing idiosyncratic movement and intimate storytelling. In recent years, Martin has also built a strong reputation as creator of dance works for others. His preferred form has remained the solo. Anatomy of an Afternoon (2012 Sydney Festival, Sydney Opera House) was a full-length solo for dance virtuoso Paul White. Slow Dances For Fast Times (Carriageworks, 2013) consisted of twelve short solos performed by a diverse group of dancers. The Little Black Dress Suite (Riverside Parramatta, 2013) featured solos performed by acclaimed dancers Kristina Chan, Sue Healey and Miranda Wheen. Martin regularly teaches for a wide range of arts organisations and companies and has extensively worked as mentor, consultant and dramaturg, most notably for solo artist Matthew Day. Martin also writes and frequently contributes to RealTime magazine. In 2012, he was nominated for a Helpmann Award in the category Best Ballet or Dance Work. Martin has also been nominated for two Australian Dance Awards – Outstanding Achievement in Independent Dance (2010) and Best Male Dancer (2005). His work has toured nationally and internationally (UK, Japan, Brazil). Last year he presented Anatomy of an Afternoon at Southbank Centre in London, with great success. Martin is a recipient of the 2015 Sidney Myer Creative Fellowships. After graduating from VCA School of Dance in 1994 Shona worked with Cursio's Dance Elixir, Mitchell's Twirling Sheila Productions, Denborough and Van Dyke’s Kage Physical Theatre. Shona became a founding member of Yong and Ping’s Wu Lin Dance Theatre performing their works in Australia and China, and a founding member of Phillip Adams' Balletlab touring to Britain, Germany, China and Mongolia. 2003 Shona performed Guerin’s Plasticine Park and worked with Neil Adams Incarna. 2005 Shona joined Cursio, for The Album Project and a tour of Korea. Since 2000 Shona has danced with the Sue Healey Company touring Healey’s works through Australia, New Zealand, Britain, Japan. 2003 they completed the Niche Series. 2004-07 Shona performed in Healey’s In Time Series, and in 2008 began work on Healey’s series, Curiosities. Shona rejoined Sue in 2013 to begin her new work On View. In 2007 Shona choreographed on STEPS Youth Dance Company, performed in Richardson’s Steamworks production Eliza!. 2011 with Dawn Jackson on Hummingbird and STEPS TRY HARD. 2013 Shona started the year performing in the Perth Fringe Festival with Natalie Cursio’s ALBUM Project before continuing work with Healey ON VIEW and choreographing for STEPS Threefold. In 2014 Shona again worked with STEPS for their 25th Anniversary year and continued with ON VIEW. She created her first full length work White Matter presented at The Blue Room Perth 2015. 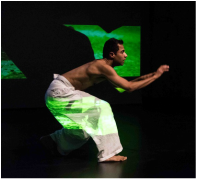 Raghav is a Sydney-based contemporary dance artist with a background in modern and Australian indigenous contemporary dance. As a performer and collaborator, he has worked in Australia and overseas with many leading Australian choreographers including Marilyn Miller, Martin del Amo, Vicki van Hout, Narelle Benjamin and Sue Healey. In 2012, Raghav choreographed his first solo work KumKum, which premiered at Freshly Squeezed (PACT). His choreographic practice was supported in 2013 through: Kick Start (Next Wave), Space Residency (Ausdance NSW), Research Room Residency (Critical Path) and JUMP (Australia Council for the Arts). In 2014 Raghav choreographed and performed his major work Tukre’, at Dancehouse for the Melbourne Next Wave Festival and toured that work to Brisbane at the Metro Arts QLD. Raghav has also recently obtained a creative development grant from the Australia Council for the Arts to develop his next major work. As a choreographer, Raghav is developing his dance vocabulary and refining his movement style, which combines his Indian heritage with delicate masculinity, speed and precision. Nalina Wait is a Sydney-based dance artist working as a performer, choreographer and junior academic. She has worked extensively with Sue Healey (2003-present) performing in all of the Niche, In Time and The Curiosities series: Fine Line (2003), Fine Line Terrain (2003), Three Times (2004), The Broken Heart (2004), Once In a Blue Moon (2005), Inevitable Scenarios (2006), The Curiosities (2009), The Bed, the Chair, the Door and the Stairs (2009), Alma and Ena (2010) and Variant (2012). 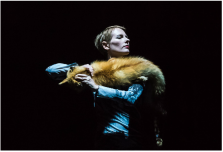 Nalina has also worked with Belgium choreographer Hans Van Den Broeck (SOIT) (2006-2011), Rosalind Crisp (1998-2002), Lizzie Thomson (2003-2010) and was a member of Sandra Parker’s Dance Works (2002). Nalina re-performed works by Joan Jonas and Marina Abramović in 13 Rooms (2013) for Kaldor Public Art Projects. Her own choreographic works include; dance film Sole (2003), 2Dual (2005), SADI (2007), Dual (2008), Slow Riot (2010), Never Odd or Even (2011), The Empty Centre (2011), Choreomania (2011) and Phosphene in collaboration with Alister Spence (2013, ). Nalina graduated from WAAPA and UNSW with 1st Class Honours and is a current PhD candidate researching how somatic intelligence contributes to the composition of improvisation. Born in Sydney, Benjamin is a graduate of the Victorian College of the Arts (VCA) with a Bachelor of Dance 2008. He has worked with a wide range of artists including Cobie Orger, Martin del Amo, Supple Fox, Vertical Shadows and Katie Noonan & The Captains, Lucy Guerin and Sue Healey. In 2009 Benjamin was commissioned by Lucy Guerin Inc to present a solo as part of their annual short works program Pieces for Small Spaces. In 2010 he won the award for Best Male Dancer at the Short Sweet + Dance festivals both in Sydney and Melbourne, for a solo choreographed by Martin del Amo and one choreographed by himself respectively. He performed in Healey’s Variant in 2010 and 2012 and recently with Lucy Guerin and Chunky Move. His new work Princess premiered as part of Chunky Move’s It Cannot Be Stopped in July 2014. An award winning cameraman specializing in feature length Comedy, Drama and Documentary. Since graduating from AFTRS in 2004, he has shot many feature films including Dr Plonk for acclaimed Australian director Rolf de Heer, which premiered at the 2007 Toronto International Film Festival. He has won numerous Australian Cinematographers Society (ACS) awards, including GOLD for Healey’s Red Shoes 2015, GOLD for Healey’s The Door, Chair, Bed, Stair (Best Experimental Cinematography 2012). Award winning short films include The Saviour which received an Academy Award nomination for Best Short Film; The Mouse That Ate My Brain Special Jury Prize at the Los Angeles International Short Film Festival; and Swing, which won the Adelaide Film Festival Audience Award and Best Film at the St Kilda Film Festival 2007. Franswa Sharl won the coveted Crystal Bear for Best Short Film. He has worked with Healey on Reading the Body (2010), The Curiosities (2011), the feature Virtuosi (2012) which won an Australian Dance Award 2013 and screened in over 30 countries, On View 2014/15, which won an Australian dance Award 2014, The Golds, which won a Diamond Award IPAMA, Indonesia 2015, and shortlisted for an Australian Dance Award 2015 and will screen at Dance On Camera, New York 2016. ​DARRIN VERHAGEN is an award winning sound designer for dance, theatre, screen and installation. He has written scores fo Sue Healey, ADT, Chunky Move, Lucy Guerin, Stompin Youth (dance), Melbourne Theatre Company, Sydney Theatre Company, Daniel Schlusser Ensemble, the Malthouse, and Chamber Made Opera (theatre), Gina Czarnecki and Patricia Picinini (installation), and SBS, Foxtel and Nicholas Verso (screen). His recent installations, have been presented at Experimenta: Recharge, Globelight Festival, White Night and the National Gallery of Victoria. Darrin is a researcher and senior lecturer in Sound Design and multisensory experience and runs the Audiokinetic Experiments (AkE) Lab at RMIT University, Melbourne. JUSTIN ASHWORTH is a composer, and multi-instrumentalist working in dance and film. He is the front person for the band "GALSFROSCH". He has a Degree in Fine Art, and has worked with Damo Suzuki, Arcko Symphonic Ensemble, TAM Projects, and Sue Healey.